Volunteer Ladakh is a grassroots non-profit voluntarily run organization which works to meet the educational and environmental needs of Ladakh. We match local needs with responsible volunteers to provide services to diverse Ladakhi communities, while offering an opportunity for volunteers to connect deeply with a unique and profound culture, nestled in the folds of the Himalayan Mountains. The organization is active in educational and environmental projects, designed to further the quality of education for Ladakh's youth and work toward sustainable ecological solutions. We work with local NGO’s, other institutions, and individuals helping to identify specific community needs and determine where to best utilize volunteer services and resources. Most volunteer positions are in rural, and thus, isolated communities, where services are few and far between. For volunteers, this means an opportunity to become an active member in a community, offering a generous spirit, a compassionate heart, and positive contributions. The rewards are life changing, opening new vistas of understanding and unity. Kelly Klein, educator, photographer, and cultural anthropologist has taught in international schools around the world. She is passionate about cultural survival and sustainability and has worked on a variety of projects with the Huichol Indians of Northern Mexico, the Aymara of Bolivia, the Zuni, Navajo, and Apache of the Southwestern US, among others. Service to others is her priority as demonstrated through many humanitarian projects around the world, including work with refugees and homeless families. Other volunteer experience includes Project Coordinator for the Charles Darwin Research Station, teaching English in numerous countries, and presently living and volunteering in Buddhist monasteries in Ladakh, Northern India. She holds an MA in Education and BA in Anthropology. She shares her reflection and photographs on her personal blog at The Journey is Home and "Wide Opening Spaces of Ladakh"
Tibetan Buddhist Monk, currently teaching at Sakya Nunnery, Tashi is committed to making quality education available for all children. With 12 years of teaching experience throughout Ladakh, Tashi intimately knows the challenges and needs within the community. 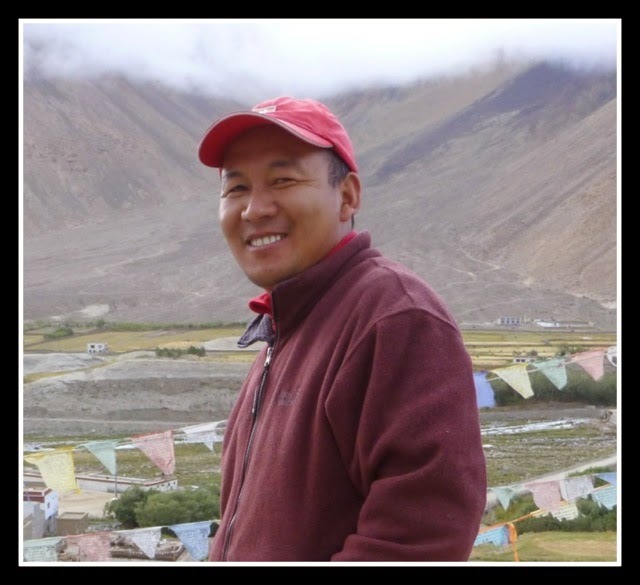 He works unremittingly to support the children of Ladakh by connecting donors with essential projects, identifying schools lacking fundamental resources, and searching for sponsors to fund educational expenses for the poorest of children. Lobzang TsultimVisuddha, community activist and leader, is passionately dedicated to his community. He has been instrumental in a starting a local school so that children could live in their homes and have access to education. Over the years, he has started several NGO’s, works tirelessly for social issues and is a respected member of the Ladakhi community. An avid bird watcher and outdoor enthusiast , Lobzang runs his own alternative travel agency which specializes in personalized tours at Ancient Tracks in Leh. For further information, please use the Contact Form to the right or write to info@volunteerladakh.org. Please keep in mind that we are in rural areas with sporadic access to internet. Please allow up to two weeks for a reply. Thanks for understanding! What a noble and commendable job done by you all . This is the best way to give back to the society which has given us so much. My forte is working and facilitating young minds. I have a teaching experience of almost 8 years. If I want to be associated with your programme, what is the best way to go about it. Your guidance would be much appreciated.